Ah right , how’s Greece , Spain , Portugal , ROI, Italy, France doing . Booming are they. "a group within a country at war who are sympathetic to or working for its enemies." you brought it up and it doesn't make any sense, hence you can't explain yourself. Well for someone who ten minutes ago didn’t understand what the term “ fifth column” meant. Probably best if you read very slowly what I’ve written again, because I’m not going to say it again, with respect. Oh yippee a chart , how very nice. Aw bless. Can't you understand it? I realise you prefer the 'but don't they know we're British' argument over actual economic reality but, sadly perhaps, the world doesn't work like that. Well it works for a lot of independent countries i.e USA , Canada , Australia , New Zealand and many , many other countries around the globe that aren’t part of a political union. A question for you - Do you want the U.K. to do well after Brexit, or do you want the country to fail ? But they are all part of economic unions. We won't be part of any economic union after we leave. And is a Yes to your question. Yes you want the country do do well ? Or yes to fail ? Yes, I want the country to be a success. But what has that got to do with anything? What economic union is the USA in ? Do you mean NAFTA ? Every single economic indicator shows our economy weakening in relation to our European colleagues. You just said that wasn't correct. I've just proved it is. You now move on to 'do you want the country to fail'. It's just one deflection technique after another. I want the UK economy to be as strong as it possibly can be, with as many people employed in decent, well paying jobs as possible, with an end to a reliance on zero hour contracts and badly paying temporary jobs. I want there to be proper protection of rights for workers and proper provision of help for those that can't work (note, I didn't say won't work). I also want there to be far less of a disparity between the rich and the not rich, and I want companies and exceptionally rich individuals to start paying their fair share of tax. I want people who are successful to be allowed to be successful. I don't believe in over taxation if the peop,e in the middle evacuee it's easier, nor do I believe that the State runs businesses well. I believe every single bit of that is best achieved by us not leaving the EU. I have concerns about some political aspects of the EU but I believe that our current opt outs protect us from the worst bits of that. I also have concerns about uncontrolled EU immigration, but believe that will simply be replaced by uncontrolled immigration from elsewhere as a result of stupid trade deals we will end up sugning. If we leave, I hope we remain within the customs union and the single market (whatever name we give them). Even if we don't, I hope that the UK does well. But in the short term at least (and who knows how long that will last), every single indicator says that won't happen. And the worst bit is that morons like May, Johnson and Corbyn all KNOW that to be the case, and none of them will admit it. Its like Whack-a-mole with you. 20 free trade agreements and the Asia-Pacific trade agreement. How quickly do you think we could sign 20 FTAs and how long do you think we can survive without any? 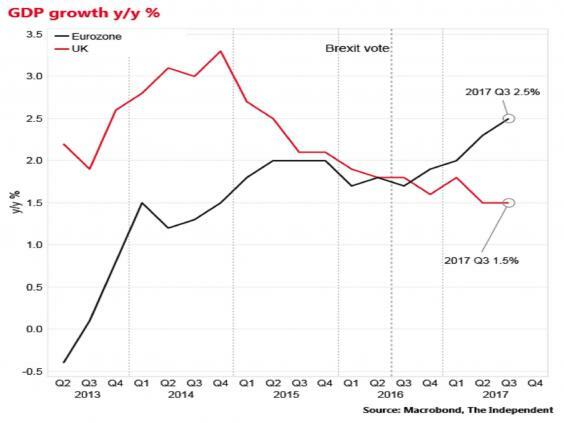 The day before the vote on Brexit, all the indicators , including the then Prime Minister, George Osborne , Bank of England , world bank , every EU country, IMF, George Soros, all predicted doom straight away. Even the president of the USA at the time ( can’t remember his name) said we’d be at the back of the queue. And don’t forget most of the so called “indicators” are published be organisations with vested interests. Now I’m no expert but after looking at that I’d say that GDP was in rapid decline Before brexit and has kind of evened itself out since. They all predicted a downturn. And there has been a downturn. And we haven't even left. Look at that graph I posted if you don't believe me. Our economy is tanking compared to our peer group. And we are at the back of the queue. Do you think the US would prioritise a deal with the EU or with us? It is not possible for me to up-arrow this post enough. Do you think trade will stop the day after Brexit if no agreement is in place ? The U.K. could operate under WTO rules , if no agreement is in place. Trade between the U.K. and say the USA will continue regardless of any on going trade deals. As I said earlier , the EU will no doubt sacrifice jobs in the EU as some sort of punishment to the U.K. and to deter other countries who may want to leave, but that’s a very dangerous game for them to play. French wine producers, German car makers and many other sectors in the EU, will be sending many employees to the job centre, with a lot of anger, could result in another nail in the EU coffin.